Whoa, today was a busy day that still felt like Monday to me. Loads going on at work and lots of errands and tasks I need to get to this week. I am feeling the additional physical activity with more running and training in the form of being exhausted at night. I am still watching and working on adding more protein to my diet and got a box from Amazon today that will help greatly in my breakfast smoothies. 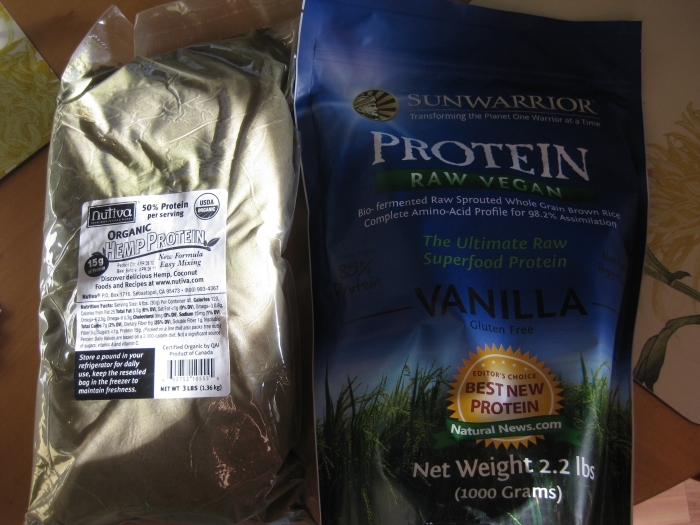 More of my old favorite hemp protein powder and something new, Sunwarrior vanilla protein powder. 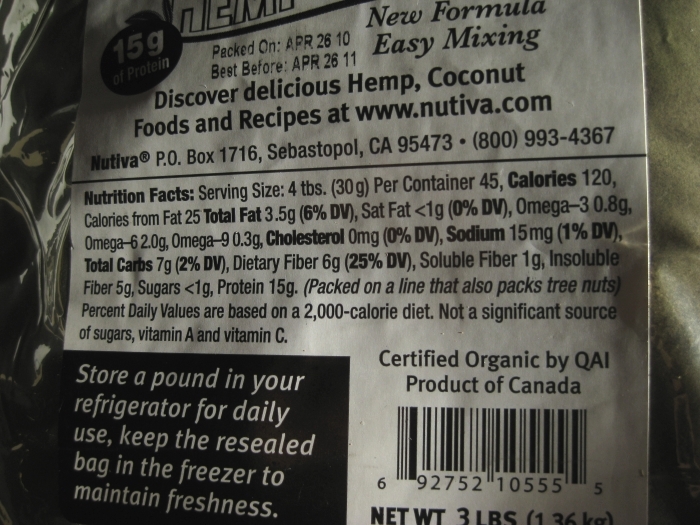 The protein count in hemp protein is impressive. 15gs per serving and a nice fiber kick, but also 120 calories per serving. The Sunwarrior is packing a bit more protein per calories. 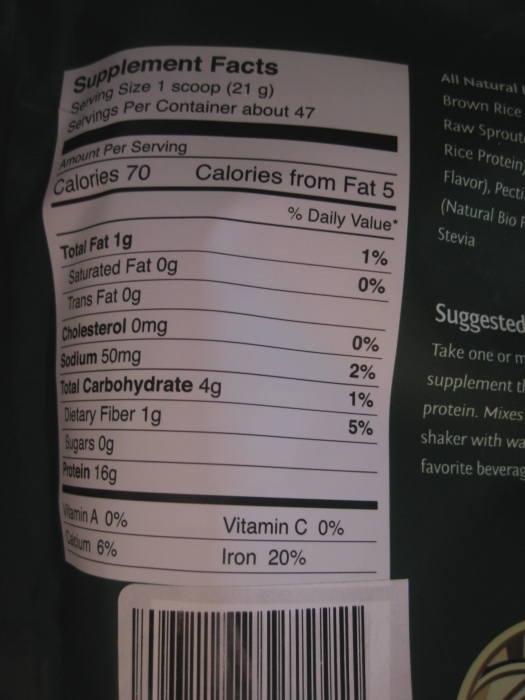 16g per 70 calories while being a good source of iron, but lacking in the fiber department. Not really a concern since there are plenty of other fiber sources in my smoothies. 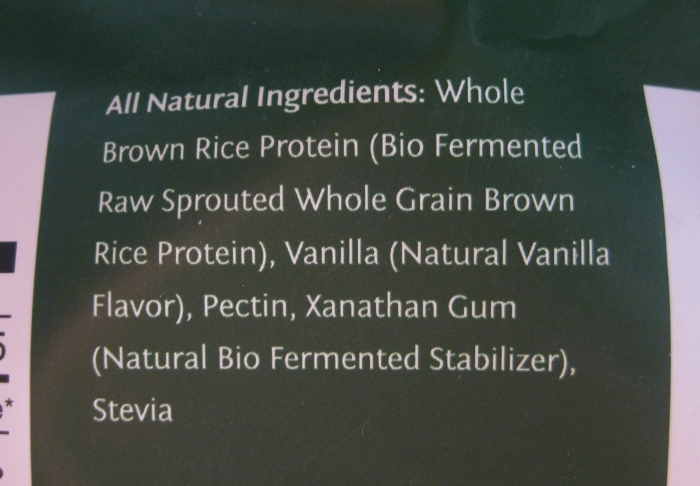 The ingredients on Sunwarrior are interesting. Nothing too freaky and I’m looking forward to trying it tomorrow morning and rotating between the two to keep up a variety. Anyway, for lunch I threw together a rushed, messy salad to enjoy while coupon surfing for a Costco shopping trip after work. 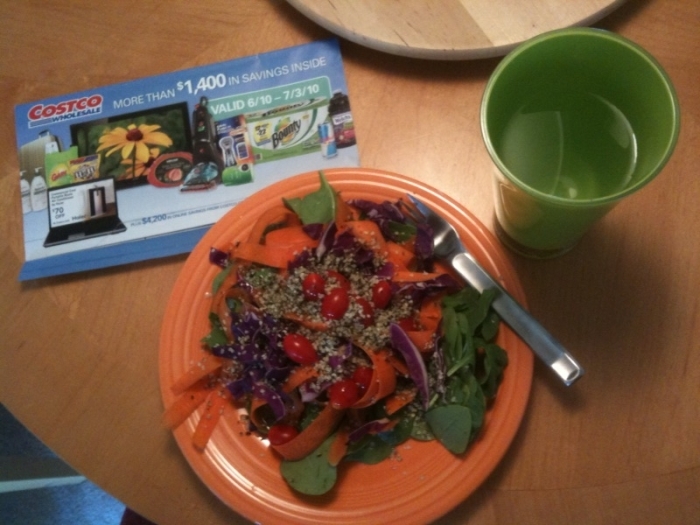 Spinach, carrots, red cabbage, cherry tomatoes, hemp seeds and dressed with Annie’s Organic Mushroom dressing. Generic, but filling and quick. Dinner was more of an elaborate taco salad. Ani’s Taco Nut “Meat” from Raw Food Essentials tossed with a fresh guacamole dressing, red peppers, spinach, sprouts and red onions. It was a spicy flavor party and the seasoned nut meat makes great seasoned chunks in a salad. 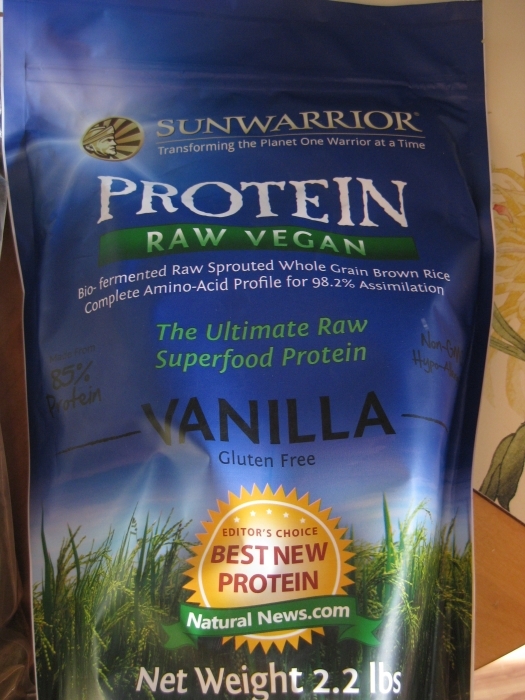 Of all the vegan brown rice protein powds (sun, jay robb, nutribiotic, no names, ) sun warri is my fave. I prefer the choc for making stuff with…but i prefer the vanilla as an add-in into smoothies, you did good..i think you’ll be happy. i mean, it’s a little chalky but ALL vegan protein is chalky. and the taste is great, in comparison to hemp or pea protein! LMK what you think of it…. 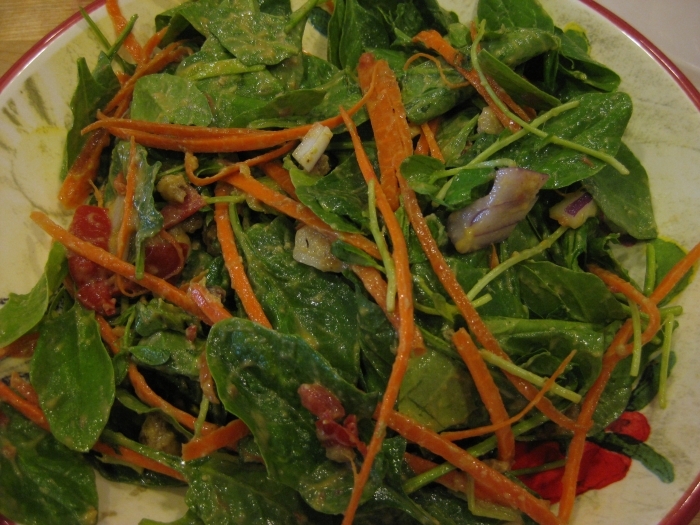 Your salads are always so droolworthy! I have the sun warrior chocolate protein powder and really like it. Ohh let us know how the Sun Warrior is! I’ve heard its one of the best. Yay that you got sunwarrior too! Yes get the chocolate next time, Im going to get the vanilla kind next!!!!! I am feeling a little more energized! Love that you have dumbells at your desk at work, such a great idea! !